The fall of the Roman Empire in the fifth century is viewed by many as one of the greatest catastrophes in the history of Western civilization. At its peak Rome was a city gleaming with gold statues, structures the size of the Coliseum covered in marble, aqueducts carrying fresh spring water, and a population of nearly one million. In less than one hundred years Rome was seized by a series of enemies, leaving a population of less than 30,000, and a wasteland scattered with ruins. These ancient ruins, which have born witness to 1500 years of the rise and decline of subsequent empires, are a constant reminder of loss and destruction. Ruins serve as evidence of the fragility of civilization and remind us of the arced trajectory of power and glory. Beginning with thirteenth century painters, through the Renaissance, and culminating in contemporary artists, Roman ruins have served as artistic inspiration and symbols of strength and fragility of empire. As remnants of empire, to a large extent ruins tell the stories of elites. Using that observation as a starting point, installation artist and photographer Shimon Attie is concerned instead to recover the untold stories, specifically those of marginalized and forgotten communities not written in stone in public spaces and architecture. While photography is often used to document disappearing histories and forestall the effects of time, giving us the illusion of reclaiming the past from further fading, Attie uses photography to make already vanished histories reappear. Using modern Rome as his backdrop, Attie projects fragments of historical photographs of Roman Jews taken between 1890 and 1920 onto the city’s ancient ruins and excavation sites. Uncovering and recontextualizing archive photographs that represent a moment of Jewish history in Rome’s long, cyclical history of persecution, Attie’s Roman Jews act as a metaphor for the outsider, the stranger, the immigrant_the individual who has an ambiguous relationship to and status within the grand history of the West. Reacting to modern Rome’s use of theatrical-kitsch artificial lighting to illuminate their ancient ruins, (which both embellishes an apparently glorious history and fires the imagination of tourists) Attie enhances the tenuousness of his subjects by placing them in the ambiguous twilight hour. His placing the marginalized set against ancient Roman ruins raises questions of who belongs to a particular history, who might not, and how history is constructed_some subjects valorized and some overlooked and suppressed. Rome is the only city in the West where Jews have resided continuously from late classical antiquity to the present. For centuries it has also been the seat of the Catholic Church, whose policies have played a major role in determining Christian attitudes towards the Jews. In 1555, after the implementation of a number of anti-Semitic laws in Italy in the early sixteenth century, Rome established the second permanent “ghetto” in Europe. Nearly 5,000 Jews in Rome, most the descendants of Roman slaves, were forced to live in a very small, walled quarter with job restrictions, education limitations, curfews, and heavy taxes, which kept the community in poverty for over three hundred years. The term “ghetto” originates from the Italian verb gettare, meaning to pour or cast, and was coined because the first segregated and enclosed Jewish Quarter was established in Venice in 1516 on the site of a municipal copper foundry. 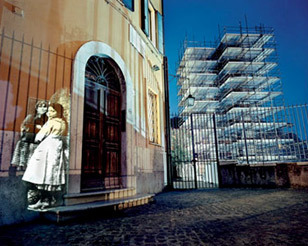 The close proximity of the Roman Jewish ghetto to key archeological and excavation sites enabled Attie to project his historical images within a few hundred yards of the location where the original photograph was taken, and, in one case, on the exact spot. If only for a brief moment, these phantoms reoccupied these grand spaces. The projected individuals—often street vendors or children—appear to either blend into the present day ruins and architecture, or to look back directly at the camera, both of which have the effect of seamlessly pulling past events into the present. This folding together of temporal elements is further enhanced by Attie’s marriage of black-and-white archive photography with late twentieth century large-scale color photography. Attie is interested in how historical and contemporary documents resonate and alter meaning in relation to each other, in a sense framing and reframing the other. For example, in the picture Looking onto Theatre of Marcellus, a projected Jewish man from the turn of the twentieth century gazes at the theater in its present day state with illuminated arches. This theater would, four decades after the man was originally photographed, become a place where Roman Jews were gathered in 1943 for deportation to Auschwitz. Today the ancient facades contain luxury apartments. Although these subsequent developments could not have been anticipated by Attie’s Jewish subject, they nonetheless have an equal claim on the ruin’s history. 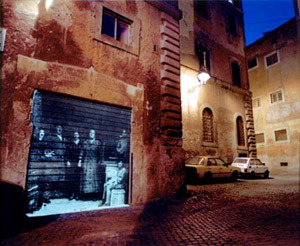 By projecting historical photographs onto ruins and also including in his frame elements of contemporary Rome, Attie creates an environment in which time becomes visible and compressed rather than invisible and expanding, like our normal perception of time. Dividing our attention carefully between three moments in the human history of this place, he implies that history might not have anything to do with time, but might be better thought of as a continuous, repetitious loop that contains both stone ruins and less tangible human ruins. 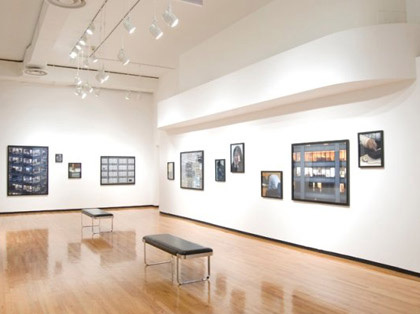 This exhibition and related programs are sponsored in part by The Firestone-Graham Foundation; the Illinois Arts Council, a state agency; Mayer & Morris Kaplan Family Foundation; the City of Chicago Department of Cultural Affairs/Gallery 37; LG electronics, Chicago and American Airlines, the official airlines of the Museum of Contemporary Photography, and our members.